Cathinone is a naturally occurring stimulant present in the Khat plant. 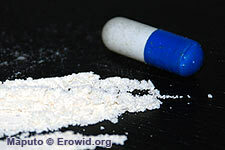 Its effects and structure are similar to those of ephedrine and amphetamine. Methcathinone: A New and Potent Amphetamine-like Agent.